Natural Fit Life-Healthy Can Be Done! 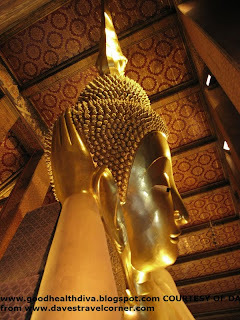 : Ideas for summer vacation: Thailand's on my mind! Ideas for summer vacation: Thailand's on my mind! What about you? Are you taking a vacation this summer? What are your plans? Some of you would be fortunate to travel abroad, expand your horizons. Maybe you just plan on going across the country and visit in a different state or you might have to find satisfaction in a vacation in your own state and its surroundings by visiting a nearby city. If you can't go on a vacation at all, please consider a pleasant staycation if anything. There are probably a few things in your city that are worth discovering. Anyway, whatever the case, I think that in most western countries the word vacation tends to present pictures of beach vacations as many of you are probably planning some beach vacations this summer. At least that's what most of us dream of after a long winter and as the most appropriate way to enjoy the warm and long summer days. For me the word vacation quickly offers images of exotic and distant places. Yes I dream of seascapes too, but even more, of rich flavors (you should know by now how much I love to eat), of surroundings with beautiful and lush landscapes, and of strong cultural experiences. There are quite a few travelers in my family starting with my parents, but my curiosity for certain places is credited to two of my older brothers especially the one that precedes me. From him I developped at an early age a passion for learning, discovering and researching places, memorizing facts and admiring pictures of places that I hope to one day make my vacation's destinations. The skills have served me well in planning some nice trips in the past or guiding others in their planning but I have yet to fulfill my dreams for making it to the destinations that top my list. One of them is Bangkok Thailand. ( Image of Bangkok's skytrain that Dave mentions in his article below). 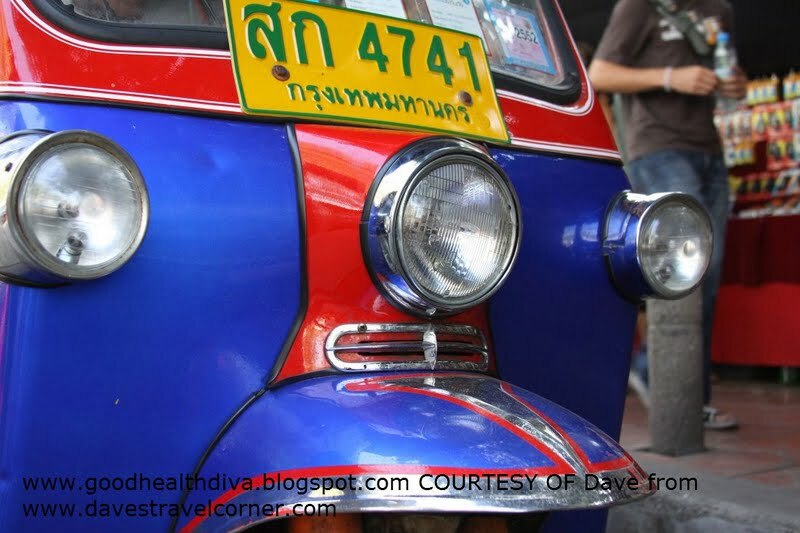 My friend Dave of Dave's Travel Corner is an experienced traveler and travel writer. 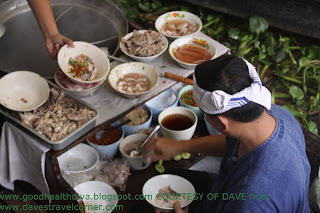 Aware of my passion for Asia and my intense desire to visit Bangkok he has graced me with an article especially written for this blog and has kindly shared a few of his own pictures to use as illustrations. I placed the pictures where I saw fit but here's about Bangkok, in Dave's own words! Bangkok is a city of energy, hustle and bustle, and sizzling temperatures most of the year to match the sizzle of the spicy Thai food. Suvarnabhumi is the fairly new International airport and serves hundreds of flights a day - it is modern, convient and connected to the main part of Bangkok by a Skytrain. Without traffic a taxi ride will take about 25 minutes. Allow up to an hour if traffic is bad. taking a river cruise down this wide brown river, soaking in the sights, smells and sounds of this busy waterway. 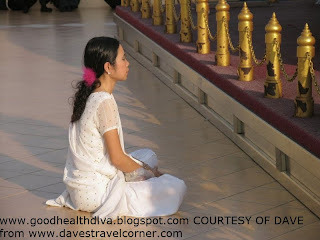 the Grand Palace, markets and a plethora of shopping in world-class malls. Thai food has engrained itself in countries around the world, but nowhere do you find the quality of flavor and food than in Thailand and Bangkok is the hub of the culinary scene in the country. Street food is almost everywhere, in some parts of the city street food is available 24 hours a day. Smiles go a long way in the "land of the smiles". People are friendly and often willing to help out tourists. So...what are your plans for this summer? Have you been to Bangkok? If yes, how do you like it compared to other places you've visited?What was your best vacation's destination? Well with all the research you have done I feel you are definitely ready :-D. I took my first airplane ride and cruise a few weeks ago. It was very nice it left me with wanting to see more of the world. I would sooo love to visit Thailand one day!! it looks soo beautiful! I love spending holidays in Thailand. because the country has unique culture. I love study and research about the culture.